Below are the upcoming workshops for building the proposals from the DESIGN-BUILD CHALLENGE. Nka Foundation is issuing a challenge to designers, architects and builders to use their creativity to come up with modern mud types for rural Gambia. This is a live project! We will select 10 project teams to realize their projects between January 2018 to December 2019. Nka will partner with each team to organize an international building workshop to, onsite, design and build a unit of a vocational skills center. The challenge is to design and build one of the following types for the vocational school: a house type for the international volunteers and visiting staff, dormitory type for local students, cafeteria type, a classroom type, office building type, or dwelling type for the local teachers. You have 10 months to conduct the online preparatory workshop, immerse in the local community, conduct site analysis and with some international volunteers build your design by use of local earth and other materials. The project may start in any month of 2018 or early 2019, but must be completed by December 2019. Keep in mind that you are designing for a student population of 200 people. Three local youths will be available to serve as your trainee to provide you with manual labor and access to local resources. Although, this is a design-build live project, it will help to specify the focus of your project, such as the house type and the construction method that your workshop participants need to anticipate. HOUSE TYPE: What house type would you like to build? Would it be a house type for the international volunteers and visiting staff, dormitory type for local students, cafeteria type, a classroom type, office building type, or dwelling type for the local teachers? ANTICIPATORY SET: Introduce the design concept, building method, materials, cultural activities, etc that you wish to explore through the project. Attach some preliminary sketches, if possible; onsite, you will finalize the design and build it. We will use this part to promote your project to get student volunteers' attention, activate their prior knowledge, and prepare them for learning-by-doing on your building project. USABILITY TESTING: How user-centered is your design? You will find out by designing, building and test-using the built unit. Usability testing is to help generate data for evaluating the built environment, if necessary, improve the design to create a more user-centered design. WHAT IS YOUR MOTIVATION: Is your design buildable? Why not take the design-build challenge and find out! To Nka Foundation, designing is not the whole thing. If you are an emerging designer, this is a unique opportunity to learn-by-doing to own knowledge about sustainable design, earth construction and project management. Nka Foundation has come to know that by immersing the young designer in the full circle of designing and building own design, at the completion of the design-build process, the emerging practitioner will learn to design what is buildable to make a well-rounded graduate. For the professionals, you will find the hands-on design and construction experience a pause from your office work stress to rediscover the rudiments of architecture and nuances that can refresh your practice. Through an open call for volunteers, each project will bring together volunteers from different countries to help you build your design. Hey! You can write a book to document your design-build journey from start to finish. Interested? Email your portfolio and CV to us at info@nkafoundation.org / www.nkafoundation.org. NOTE: The deadline the above site was June 30. However, we will welcome proposals from serious individuals and teams for realization in our sites in Senegal, Tanzania and Ghana. Join us as an international volunteer to build a sustainable classroom in Sang, a mud earth unit for a vocational skills center for youths in rural Ghana. Immerse yourself in local culture and lifestyle, and come to give your tangible contribution to help local people. Irene Librando and Nadia Peruggi at Unversità degli studi di Napoli Federico II, Italy. This winter, I am going to Gambia to help build a unit of a vocational skills center with the youths of Kassi Kunda village in the Upper River Region of Gambia. Join us as a workshop participant in a case study house about building with local earth and communal dwelling typology. Together, we will be temporarily Gambians by immersing in local culture and lifestyle to gain an in-depth understanding of the local issues and practical experience. You’ll have the opportunity to explore local architecture traditions through site analysis, field trips and the construction process. Volunteers can join at any time and participate for a minimum of two weeks. A student can use the opportunity for an internship, thesis or personal research to rediscover the rudiments of architecture and nuances to enrich your design thinking. WHO: Graduates and students of architecture, design, engineering and volunteers from around the world. WHO: Project is open to international volunteers, you can learn more about earth construction while contributing to community development in rural Gambia. Everyone is welcome to join. Students of architecture, design and engineering can use the opportunity for internship, thesis work or personal research. COST: Participation fee: 400€; food and accommodation: 80€/week (Airfare, visa and vaccination are on your behalf). Financial help is possible, contact us! PROJECT LEADER: Miguel Pires Amado, a Portuguese architect and urban planner and a professor at Instituto Superior Tecnico at Universidade de Lisboa, where he teaches architecture. Join this Stamping Ground Workshop, supported by the Nka Foundation, for the opportunity to collaborate in the construction of a classroom unit for a vocational skills center in The Gambia. Construction will be undertaken alongside local young people, professionals and volunteers from around the globe - providing the chance to share knowledge, skills and cultures, in an immersive environment. 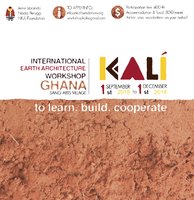 Participate at any time during the workshop for a minimum of 2 weeks, and take part in a variety of stages - from design finalisation and site analysis, to earth and thatch construction. PROJECT SITE: Kantora Arts Village, Kassa Kunda, The Gambia. WHO ARE WE ? : Jennie Schneider & Daniel Wilson, graduating Masters students at Aarhus School of Architecture in Denmark. WHO ARE YOU ? : Graduates or students of architecture, design and engineering, or someone enthusiastic to gain hands-on construction experience and cultural exchange.